Actually, a more accurate title of this post would probably be “Not-So-Little Black Maternity Dress,” since there’s room for a watermelon in it. But since it’s black and quite fitted, I’d still put it in the LBD category. I’ve already mentioned my new affinity for fitted dresses during pregnancy. I’ve seen one too many pictures of my mom while pregnant in the ’80s to know that muumuus make you look about as shapely as a Christmas tree (sorry, mom!). 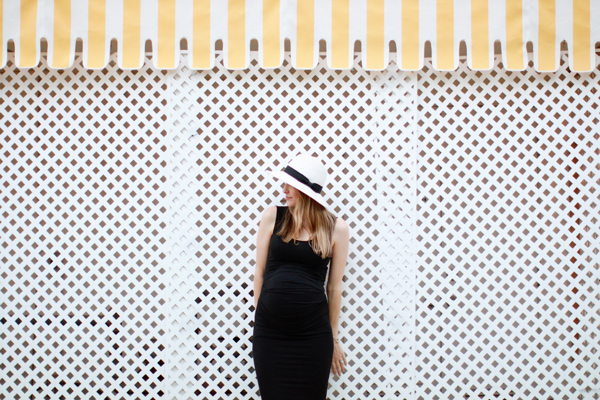 I added another bump-hugging dress to my maternity wardrobe in time for our babymoon to sunny Palm Springs. The tank-style LBD is perfect for warmer temps as we head into spring here in California. Ingrid and Isabel maternity tank dress. P.S. More highlights from our babymoon in Palm Springs.